Once the stuff of sci-fi films, connected cars have gone from fantasy to fact. Cars are no longer just a way to get from A to B; soon you’ll be able to shop, pay, play, buy and drive, all from the comfort of your connected car. By 2025, nearly 1 billion vehicles with Internet of Things (IoT) connectivity will be on the road. But that’s not all – experts expect fully-autonomous cars to hit the market the same year, with these complementary technologies offering incredible opportunities for the payments industry. So, what exactly do we mean by connected cars? And why are automakers scrambling to develop in-car payment capabilities? IoT-based car services will include navigation, communications, security, monitoring and maintenance. Most importantly of all for the payment industry, IoT will also enable in-car sales of services and products, the potential for which will grow exponentially as driverless cars become commonplace. An Intel and Strategy Analytics report forecasts that the so-called passenger economy could be worth $7 trillion by 2050, up from $800 billion in 2035. These earnings will primarily come from business and consumer use of mobility-as-a-service, as self-driving vehicles free up over 250 million hours of passengers’ commuting time annually in the world’s most congested cities. Automakers have been doing exactly that, announcing a flurry of acquisitions and partnerships related to in-car connectivity and in-car payments over the past 18 months. China’s Alibaba teamed up with SAIC Motor Corp in June 2016 to unveil the RX5, a car embedded with Alibaba’s Alipay payments service, allowing drivers to pay for parking spaces and fill up with fuel from within the vehicle. “Smart operating systems become the second engine of cars, while data is the new fuel,” Jian Wang, chairman of Alibaba’s technology steering committee said at the time. January’s Consumer Electronics Show in Las Vegas heralded a deluge of similar tie-ups: Visa and Honda announced a proof-of-concept connected car that would enable drivers to perform similar in-vehicle tasks as on the RX5; Ford revealed it will provide Amazon Alexa voice-based services in some vehicle models; and Hyundai and Google Assistant also joined forces. Last December, Volkswagen acquired PayByPhone, an app enabling parking payment via a smartphone, available in Canada, the United States, France, Britain, Switzerland, and Australia. A month later, rival Daimler bought electronic payment services provider PayCash Europe to launch “Mercedes Pay”, which will deliver various mobility services, including car-sharing platform car2go and the mytaxi app. Broadly speaking, there will be two types of in-vehicle payments: those related to driving and the car itself – such as parking, tolls, ticketing and infotainment; and those in which the vehicle is part of the wider connected environment – such as being the destination for deliveries, or the use of the car key fob as a digital payment device outside the car. Aside from commuting to work, one of the most common journeys that drivers make is to the shops, and so marketers see great potential in being able to deliver location-based advertising and money-saving vouchers or special offers when a vehicle approaches the main shopping street or mall. While some of these ideas may seem far-fetched, some are already reality – in Gothenburg, Sweden, Volvo offers in-car delivery from select stores, while in Germany, Audi teamed up with Amazon and DHL in a trial service to provide Amazon Prime deliveries to its cars in Munich. Also coming into play is the growing trend of car-sharing, particularly amongst younger people, to save costs and reduce environmental impact. Greater vehicle autonomy will also erode notions of car ownership; in the future, people will be able to hire autonomous cars, much like a taxi, on a journey-by-journey basis, as well as for longer periods, be it hours, days, weeks or more. Both autonomous vehicles and the rise of car-sharing are rapidly revolutionizing the entire automotive industry and the travel experience in itself. For example, if there are several passengers sharing a car ride, and the car is an autonomous, self-driving vehicle, what will the passengers do during the journey? The next step in autonomy and in-vehicle payments was unveiled in Paris on 7 November 2017, when driverless vehicle pioneer Navya launched the new Autonom Cab. The 100% electric vehicle is designed for modern city life and hopes to eventually eliminate traffic jams, parking problems and pollution. The Autonom Cab can be booked, unlocked and started with a single click via the Navya App, and features a futuristic design without cockpit, steering wheel and pedals. 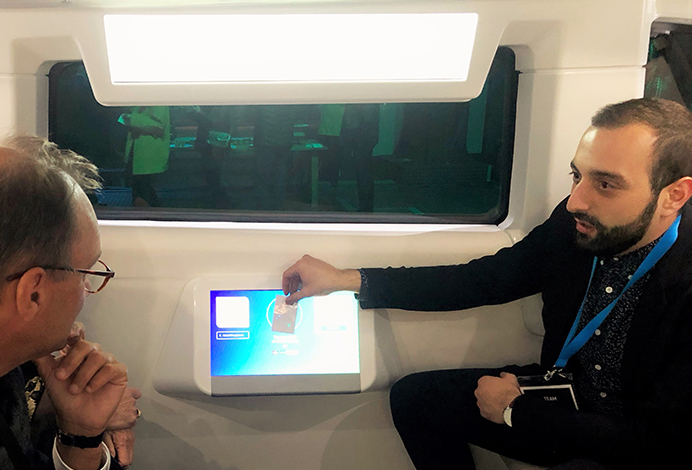 The embedded Ingenico connected screen offers a variety of services, allowing passengers to even buy a museum ticket or book a restaurant directly from the car. A business could use the vehicle as a company car, with employees able to pay for in-car services via their company ID badge, for example. It can also be used by city residents – users could tap their transport card, which they normally use to take the bus or metro, to pay for car hire and in-car services. For tourists, the car could have a city tour of Paris as a pre-installed route showing all the attractions and avoiding any traffic. Why are you so excited about connected cars? The connected car is part of a larger trend of IoT, or Internet of Things. As more and more devices become digital, connected interactions between consumers and merchants are being created that could result in a transaction. We have already deployed over 300 connected screens worldwide, mostly in shopping malls, and bringing similar technology to cars is an incredible opportunity as two key trends combine – the adoption of self-driving cars and a shift towards car-sharing, rather than car ownership. What kind of transactions can connected cars make? How can Ingenico help automakers monetize in-car connected services? Our vision is to help create a payment ecosystem, or marketplace, for car manufacturers. From this marketplace, consumers will be able to buy various services – book a hotel, order fast food or pay for fuel at the gas station, for example. If a connected car is being used for car sharing, passengers will likely be wary of putting in their card details, so we provide an alternative – installing a secure payment terminal inside the car that, through our payment gateways, can process payments for marketplace services. There are still a lot of legal and security constraints around marketplaces, so with Ingenico’s payment expertise we can help automakers build that capability. Why would people use the in-car marketplace rather than apps on their mobile phone? In a word: convenience. Say you’re using the car to visit a new city, you probably wouldn’t have that city’s local applications on your phone – for parking and so on. Similarly, would you download every different petrol station app so that you could buy fuel anywhere? Wouldn’t it instead be more convenient to use an in-car marketplace where all these capabilities are already installed with no effort required on your part? Now, imagine an in-car multimedia system where you can simply ask for restaurant table or hotel room availabilities and it will not only book it for you, but subsequently process payment too. Your car opens up a whole new marketplace. There is no need to install everything on your smartphone; your car will do all that for you. Can’t car manufacturers do all this themselves? How does Ingenico come into it? OEMs aren’t merchants or retailers, so they don’t have any expertise in managing payment cards or multi-currency transactions. Managing these kinds of services is not their job; their job is to produce cars. They need Ingenico to help them run this marketplace. The first step is through mobile applications and then, in the future, directly within the car itself through an in-car connected screen. We’ll provide authentication services, be it through a camera, fingerprint verification or voice recognition to authorize payments, for example. Christian joined Ingenico in 2015. He is in charge of strategic business development within Ingenico Labs. His role is to lead technological and business partnerships related to the Labs’ innovations and IOT projects. 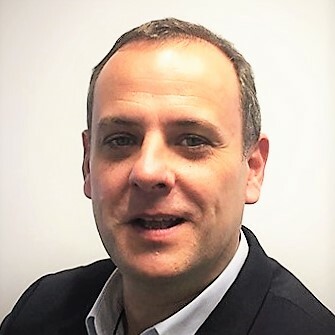 Christian has 15 years of successful experience in sales and business development within competitive and technological environments. Christian is passionate about innovation serving business growth.